entirely by the devil, sometimes entirely by one member of the community, and sometimes-picnic-fashion again-all the company brought their own provisions. Consequently the quality of the food varied considerably; on some occasions it was very good, on others very homely. But no matter who provided it, the thanks of the feasters were solemnly and reverently given to the Master, to whose power the production of all food was due. In a certain number of cases it is said that the food eaten at the feasts was of an unsatisfying nature. This statement is usually made in the general descriptions given by contemporary writers; it is rarely found in the personal confessions. When it does so occur, it is worth noting that the witch is generally a young girl. If this were always the case, it would be quite possible that then, as now, dancing and excitement had a great effect on the appetite, and that the ordinary amount of food would appear insufficient. The taboo on salt is interesting, but it does not appear to have been by any means universal. It does not seem to occur at all in Great Britain, where the food at the feasts was quite normal. Some authorities appear to think that the witches ate the best of everything. They sit to Table where no delicate meats are wanting to gratifie their Appetites, all dainties being brought in the twinckling of an Eye, by those spirits that attend the Assembly'. Though this is dramatically expressed it is confirmed by the statements of the witches themselves. The Lancashire witches had a great feast when they met in Malking Tower to consult as to the rescue of Mother Demdike. [1. Pleasant Treatise of Witches, p. 5. [1. Examination of Joan Williford, p. 6. At Borrowstowness the witches went to different houses for their feasts, which seem to have been supplied partly by the hostess, partly by the Devil and the guests. [1. The complete grace is given on p. 167. It will be seen that it is a corrupt version of some ancient form of words. 2. Pitcairn, iii, pp. 612, 613. Spelling modernized. 3. Scots Magazine, 1814, p. 200. Spelling modernized. 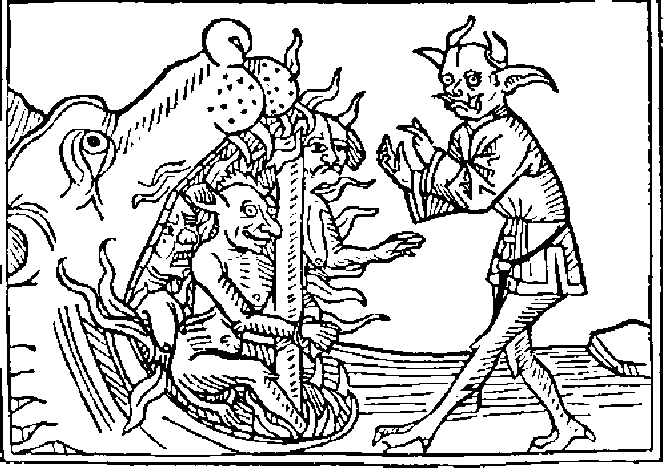 In Sweden the witches collected the food and sent it to the Devil, who gave them as much of it as he thought fit. The feast was always held indoors in the house known as Blockula.